Some of operations (e.g. deleting tweets, make tweets favorites) in twicli may cause displaying download dialog unexpectedly in Opera. To avoid this, the settings below are required. 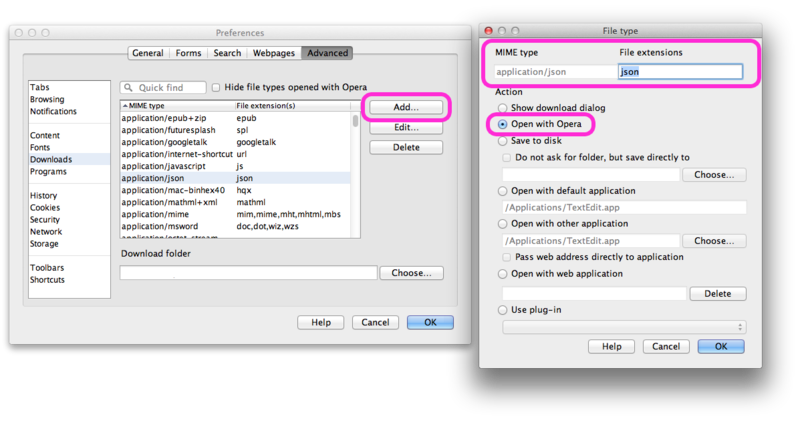 Go to Opera preferences -> Advanced -> Downloads. Enter MIME type: "application/json", file extension: "json", and select action "Open with Opera". Press OK to close the dialogs. This is because XML-form API is obsoleted and only json-format API is supported in Twitter API 1.1.